Background: Sesamum indicum is a widely cultivated crop with edible seeds which are well known for its rich antioxidant properties. The plant leaves have also been reported to have health functional attributes such as lowering cholesterol level in body, reducing cancer, and acting as antihypertensive resource. 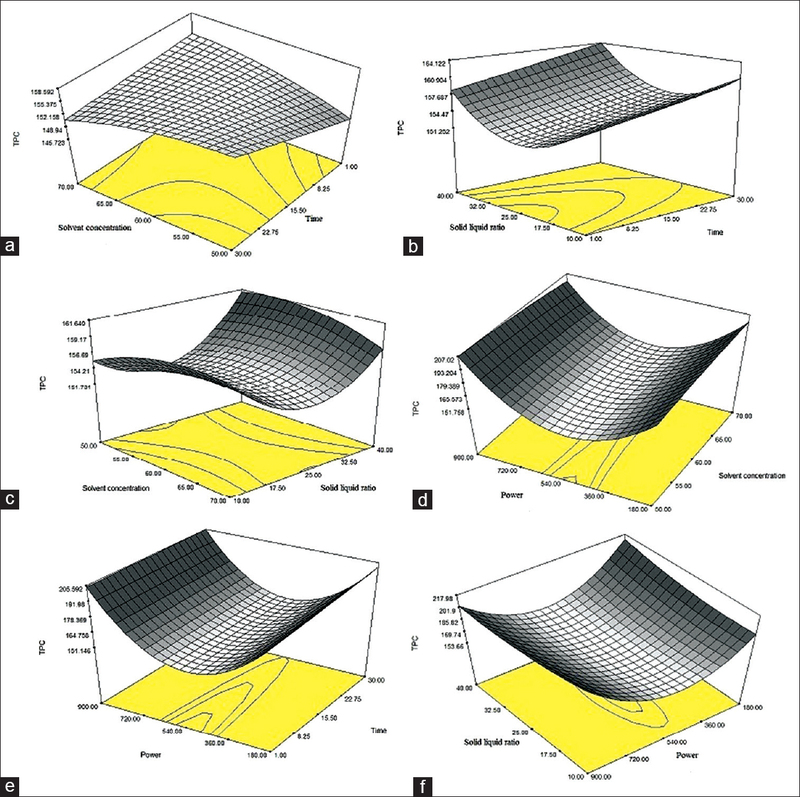 Objective: The aim of the study was to optimize the effects of solvent-based microwave-assisted extractions (SMAEs) of phenolic compounds from S. indicum (Sesame) leaves using combined approach of response surface methodology and particle swarm optimization (PSO). Materials and Methods: SMAEs along with response surface model development and its optimization by PSO were done. The optimization parameters such as microwave power (180–900 W), extraction time (1–30 min), solid-liquid ratio (1:10–40 g/mL), and solvent (methanol) concentration (50–70%) were employed to obtain extracts showing higher total phenolic content (TPC) and antioxidant activities by 2,2-diphenyl-1-picrylhydrazyl (DPPH) value. Results: The maximum TPC and DPPH values were 206.14 ± 2.70 mg GAE/100 g and 96.04 ± 1.67% for extracts against 51.38% methanol concentration, 1:23 g/mL solid-liquid ratio, 900 W power level, and 16.95 min of extraction time, respectively. The gas chromatography–mass spectrometry chromatographs showed the presence of various essential phytocomponents such as ascorbic acid, phytol, and flavonol as functional molecules at 26.79, 29.03, and 39.70 min retention time, respectively. The high-performance liquid chromatogram further confirmed the presence of quercetin, chlorogenic acid, and gallic acid at a concentration of 11.25, 4.28, and 1.61 ppm, respectively. Conclusion: The results of this study suggest application of PSO algorithms as an efficient approach to optimize the extraction of bioactive components from Sesame leaves which can be used as a potential source for functional and nutraceutical food development. Abbreviations used: TPC: Total phenolic content; DPPH: 2,2-diphenyl-1-picrylhydrazyl; RSM: Response surface methodology; BBD: Box–Behnken design; BSTFA: N, O-Bis (trimethylsilyl) trifluoroacetamide); LDPE: Low-density polyethylene. An effective Solvent Based Microwave-assisted Extractions (SMAE) based on response surface methodology using integrating particle swarm optimization (PSO) for various parameters like microwave power (180-900 W), extraction time (1-30 min), solid-liquid ratio (1:10-40 g/mL) and solvent (methanol) concentration (50-70%) were done for effective extraction of essential phytocomponents from Sesamum indicum Leaves. The optimized parameters were based on Total Phenolic Content (TPC) and antioxidant activities by 2, 2-diphenyl-1-picrylhydrazyl (DPPH) values whichwere 206.14 ± 2.70 mg GAE/100 g and 96.04 ± 1.67% for the power level of 900 W; extraction time of 16.95 min; solid-liquid ratio of 1:23 g/mL and methanol concentration of 51.38 % respectively. The optimized extracts showed presence of various essential functional phytocomponents like ascorbic acid, quercetin, chlorogenic acid, gallic acid, phytol and flavonol which can be further explored in nutraceutical formulations. Polyphenols are the secondary nonnutritive plant metabolites naturally occurring in various parts of plant such as roots, barks, stems, leaves, fruits, and flowers., These compounds consist of an aromatic ring with one or more hydroxyl groups which possesses simple to very complex structure. Flavonoids and phenolic acids have various health benefits which include reduction of various lifestyle diseases such as cancer, cardiovascular diseases,, hepatotoxic, analgesic, diabetic, inflammatory, and allergic diseases, and osteoporosis.,,, The molecular mechanism of various polyphenols with respect to their biological activities is well elaborated. Sesame (Sesamum indicum), which belongs to the plant family Pedaliaceae, is an important oil-producing crop, leading to 60% of the total global yield, mostly cultivated in China, Burma, India, and Sudan., It is an evergreen annual flowering plant consisting of edible seeds with high antioxidant effect,, and ability to lower cholesterol levels, cancer incidents, and hypertension in our body. Thus, this can be a potent source to identify the presence of bioactive components and using effective extraction technique to give maximum yield without degrading the functional properties. Different methods of extractions using solvents, enzymes, pulsed electric field, high voltage electrical, microwave, subcritical water, etc., have been explored to extract bioactive components from different sources.,,,,, Microwave-based extraction method have advantages associated with it over traditional methods of extractions due to properly sealed extraction system, which allows the solvent's temperature to reach its boiling point and resulting in increased efficiency of extraction of phytochemicals with reduced time of incubation. Microwave-based extraction has been used for efficient extraction of tea phenols, pectin from dried orange peel, and essential oils from leaves of rosemary and peppermint. Recently, curcuminoids, one of the essential compounds from Curcuma longa, has been optimally extracted using ionic liquid-based microwave method. Particle swarm optimization (PSO) has been proposed over steepest ascent or descent techniques for response surface methodology (RSM) as these methods are limited to find the local minima. PSO is an advanced population-based search method with efficient statistical and hypothesis testing concepts inspired by the social behavior of bird flocking. These optimization techniques based on population can effectively and efficiently find solutions among the population through proper cooperation and competition. They have been popular in academia and industry due to the usage of less control parameters, easy to implement strategies, and ability to solve nonlinear optimization problems. The aim of this study was to explore the effectiveness of microwave on optimum extraction of polyphenols from Sesame leaves, which is an important medicinal plant. However, there have been minimal scientific reports documented on its properties that prove its true medicinal values. Therefore, RSM along with PSO was employed using different optimization parameters such as microwave power, time, solvent concentration, and solid-liquid ratio, respectively, to optimize the extraction process. Leaves of S. indicum were collected from local areas of Nagaon, Assam, India, during June–July. The leaves were identified by a botanist from the Department of Botany, ADP College, Nagaon, Assam, India. The samples were carried in a sterile airtight container, washed, and stored in the freezer (4°C–8°C) until further use. The leaves were dried in a hot air oven at 35°C–40° °C for 72-80 h grounded to powder form with the help of a laboratory grinder (Make-Philips, Model-hl7600), sieved through 60-mesh sieve, and stored in airtight low-density polyethylene pouches for future use. Sodium carbonate (Na2 CO3), Folin–Ciocalteu's phenol reagent, gallic acid, 2,2-diphenyl-1-picrylhydrazyl (DPPH), N, O-bis (trimethylsilyl) trifluoroacetamide (BSTFA), and trimethylchlorosilane (TMCS) were procured from HiMedia, India. The high-performance liquid chromatogram (HPLC) standards were purchased from Sigma, India. All the solvents (methanol, ethanol) were of analytic grade and procured from Merck, India. Microwave treatment for the extraction of phenolics from Sesame leaves powder was done using a laboratory scale microwave oven system (Microwave model-MJ3283BCG, Make-LG), which was featured with a digital control panel system for irradiation time and microwave power. One gram of leaf powder was used for solvent-based microwave-assisted extractions (SMAEs) in aqueous solutions of methanol at different concentrations. The variable microwave extraction parameters were power level (180–900 W), extraction time (1–30 min), solid-liquid ratio (1:10–40 g/mL), and methanol concentration (50–70%). The Box–Behnken experimental design using “Design Expert 6.1 (Stat-Ease, Inc. USA)” software was used for different combinations of extraction parameters. After microwave-assisted treatments, the extracts were filtered through a Whatman Filter Paper No-1 and stored at 4°C until further use. All the experiments were carried out in triplicate and compared with control (methanol-extracted sample). For control, 10 g of sample and 50 mL of solvent (70% methanol) were added. Further, it was incubated at 30 °C for 24 h with 200 rpm in a shaking incubator (Orbitek, Scigenics Biotech Private Limited India) and filtered through Whatman filter Paper No-1. Total phenolic content (TPC) was determined using a modified version of the Folin–Ciocalteu's assay. In brief, 20 μL of sample extract is mixed with 1.58 mL of distilled water and 100 μL of Folin–Ciocalteu's reagent and incubated for 8 min at room temperature followed by addition of 300 μL of 10% Na2 CO3 and further incubation at 40°C for 30 min in the dark. The absorbance was taken at 765 nm. Mixture with addition of distilled water instead of extracts served as blank. The standard curve for TPCs was calibrated using standard solution of gallic acid (0–100 mg/L). The results were expressed as gallic acid equivalents (GAE)/100 g. The methanol extracted sample was used as control for the study. Where A0 is the absorbance of control blank and As is the absorbance of sample extract. Methanol extracted sample served as control for the study. Where Y is the predicted response, β0 is a constant, βi is the linear coefficient, βii is the quadratic coefficient, βij is the interaction coefficient of variables i and j, and Xi and Xj are the independent variables. To build response surfaces, this quadratic equation was used by the software. The adequacy of the model was determined by evaluating the coefficient of determination (R2), lack of fit, and the Fisher's test value (F value) obtained from the analysis of variance (ANOVA). The significance of the model and model parameters was determined at 5% probability level (a = 0.05), 1% probability level (b = 0.01), and 0.1% probability level (c = 0.001), respectively. Keeping one response variable at its optimum level and plotting against two factors (independent variables), three-dimensional response surface and contour plots were generated. The actual and the coded values used in the optimization studies are listed in [Table 1]. The complete experimental design consisted of 29 experiments, of which five experiments were at the central level [Table 2]. Optimization of the solvent-based microwave-assisted treatments of dried Sesame leaves were carried out using the standard PSO (SPSO) method programmed in MATLAB R2015a (Math works, USA). SPSO is an advanced computational population-based evolutionary optimization method, inspired by the social behavior of bird flocking, and can effectively and efficiently find solutions among the population through proper cooperation and competition. According to historical experience and that of other particles, each particle flies in a D-dimensional space “S” in the SPSO model. The velocity and location for the ith particle are represented as , respectively. The search process of the particles is according to the following equations. Where xid and vid are the dth dimension location and velocity for ith particle, acceleration constants are c1 and c2; the random values between 0 and 1 are rand(); the vector pi and pg gives the best position of the best fitness value of the particle i and in the population where the inertia weight for balance of global and local search ability is w. In SPSO system, irrespective of the model employed, each particle converges to its local point “p” with coordinates p = (φ1pi + φ2pg)/(φ1 + φ2), where they converge to an exclusive global position at t→∞, where φ1 and φ2 are random numbers distributed uniformly on [0, 1]. The reverse-phase HPLC (RP-HPLC) analysis of the optimized plant extract was carried out in a RP-HPLC (Waters system) coupled with a 240 UV-vis detector. The extract was prepared by dissolving it in HPLC-grade methanol followed by filtration through a 0.22 μm nylon filter. Samples were separated in a C18 column of 4.6 mm × 250 mm where the mobile phase used was acidified ultrapure water (0.1% acetic acid, pH 3.2, mobile phase A) and methanol (mobile phase B). The gradient elution with a flow rate of 0.8 mL/min and the sample volume of 20 μL was as follows: 80% A (0–8 min), 65% A (9–12 min), 45% A (13–16 min), 30% A (17–20 min), 20% A (21–30 min), 10% of A (31–34 min) followed by column washing with 65% A (35–39 min), and finally with 80% A (40–45 min). HPLC standards such as gallic acid, catechin, syringic acid, rutin hydrate, quercetin, chlorogenic acid, ferulic acid, and apigenin were used for the identification and quantitative analysis. Absorbance was measured at 254 and 325 nm, respectively. The data were compared with methanol-extracted sample which was used as control in the study. The phenolic components retended in the optimally extracted solvent-based microwave-treated extracts were analyzed using gas chromatography–mass spectrometry (GCMS) in Agilent GC System 7890A (USA) coupled with a 240 MS mass detector with capillary column of 30 m × 0.320 mm and 0.25 μm thick film. The samples were initially derivatized by addition of 50 μL of BSTFA with 1% TMCS to 500 μL of optimized extracts followed by heating in a water bath at 80°C for 45 min. An aliquot of 20 μL derivatized sample was injected into the gas chromatography system in a splitless mode at an injector temperature of 250°C using helium as carrier gas flowing at 1 mL/min. Initially, the oven temperature was set at 50°C for 2 min followed by heating to 230°C at a rate of 6°C/min maintained for 10 min. The electron impact ionization energy was 70 ev, and the mass spectra were scanned from 30 to 450 m/z. 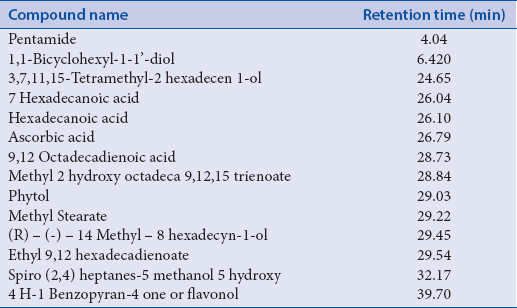 Detection and identification of the polyphenols were based on comparison of the mass spectrum and retention time (RT) of the extracts with the reference standards (NIST Database v 2.0). The dried powder of both control and SMAE-treated samples were analyzed for structural deformities using a scanning electron microscope (JEOL JSM 6390 LV, Singapore). The dried samples were sputter coated with platinum, and their surface and shape morphological analysis was done at different magnifications at an accelerating voltage of 20 kV. Polyphenols, the major phytocompounds present in plants, play a significant role in maintaining good health. The existence of these phytocompounds in complex form with numerous proteins and sugars creates difficulties during extraction and purification process. Thus, for effective extraction with high yield, different solvent-based microwave extraction parameters were done and discussed below. For efficient extraction of analytes, solvent plays an important role. A good solvent should have good dielectric constant along with good capacity to absorb microwave energy. Initially, at 50% solvent concentration, the yield of TPC was 208.69 ± 1.04 mg GAE/100 g against 1:25 g/mL solid-liquid ratio, 900 W power, and 15.5 min extraction time, which gradually increased to 216.73 ± 2.67 mg GAE/100 g with increasing amounts of the solvent concentration in the extraction medium up to 60% [Table 2]. However, TPC yield began to decline with an increase in solvent concentration up to 70% in the extraction medium. The yield of TPC was initially low at lower solvent concentrations with a gradual increase at 60% followed by decreasing trend at the higher solvent concentrations, i.e., 70% [Figure 1]a, [Figure 1]c, and [Figure 1]d. This may be due to microwave heating for which there might be difference in dielectric properties of the solvent. As a result of this, extraction rate is hampered, and hence, low concentration of solvent gets easy access to cells whereas, at higher concentration, denaturation occurs. Our results are in agreement with the recently published data where the amount of phenolics increased to 173.49 mg GAE/g with increased solvent concentration up to 40%. The yield of analytes to recover depends on extraction time, though prolong exposure degrades its biological functionalities too. Hence, optimal exposure time is recommended for better yield of analytes. Recovery of phenolics was 205.73 ± 0.46 mg GAE/100 g at 60% solvent concentration, 1:25 g/mL solid-liquid ratio, 900 W microwave power, and 1 min extraction time, with a maximum amount of phenolics of 216.73 ± 2.67 mg GAE/100 g at 15.5 min further, followed declining trend [Table 2]. Initially, at lower extraction time, there was no significant release of polyphenols, while later on, with increase in time, TPC yield increased gradually [Figure 1]a, [Figure 1]b, and [Figure 1]e. This may be due to the fact that extended extraction time under constant microwave power influences higher polyphenol yield before reaching degradation stage. During MAE from Roselle seeds, increased extraction was observed with increased extraction time. In another report, increased extraction yield with increase in extraction time with MAE studies of Bixa orellana (annatto) was observed. For efficient extraction of phytobiomolecules, solid-liquid ratio is an influential parameter. Low heating was observed for high solid-liquid ratio as most of the microwave energy was absorbed by the solvent. Thereby, 10–30 mL solvent and 30-34% amount of sample in the solution along with a smaller vessel size were recommended for the use in microwave extraction process, due to their ability to generate high internal pressure. Thus, average values were recommended for efficient extraction. TPC yield initially was 216.73 ± 2.67 mg GAE/100 g at 60% solvent concentration, 900 W microwave power, 1:10 g/mL solid-liquid ratio, and 15.5 min extraction time [Table 2]. However, TPC yield decreased to 208.69 ± 1.04 mg GAE/100 g with increase in solid-liquid ratio to 1:25 g/mL. However, higher recovery of phenolics was seen at 1:40 g/mL solid-liquid ratio. Response surfaces of the effects of solid-liquid ratio with time, solvent concentration, and power indicate increased extraction rate [Figure 1]b, [Figure 1]c, and [Figure 1]f. The higher yield of phenolics was observed at higher solid-liquid ratio which might be due to polarity of the solvent. The effective extraction involves important effect of solvent concentration-to-sample ratio which leads to release of phytobiomolecules. Similarly, maximized extraction of safflomin A from Flos carthami was reported with increase in solid-liquid ratio up to 1:20 g/mL. Microwave power also plays a significant role in deciding the maximum extraction of phenolic compounds. The yield of phenolics was 215.99 ± 1.67 mg GAE/100 g at 15.5 min extraction time, with 1:40 g/mL solid-liquid ratio, 180 W microwave power, and 60% solvent concentration [Table 2]. Later on, with increase in microwave power, recovery of phenolics significantly reduced to 164.12 ± 2.93 mg GAE/100 g. However, an increased release of phenolics was seen at 900 W microwave power treatment. [Figure 1]d, [Figure 1]e, and [Figure 1]f represents an increase in release of phenolics with an increase in microwave power up to 900 W. This might be due to the fact that higher microwave power generates microwave radiation which leads to increased heat and pressure on the plant cell in an extended manner until plant tissue was ruptured which leads to increase in interaction between the solvent and plant cell, thus resulting in improved TPC yield. Similar trend of result was also reported where an increased release of phenolics at 900 W was observed. 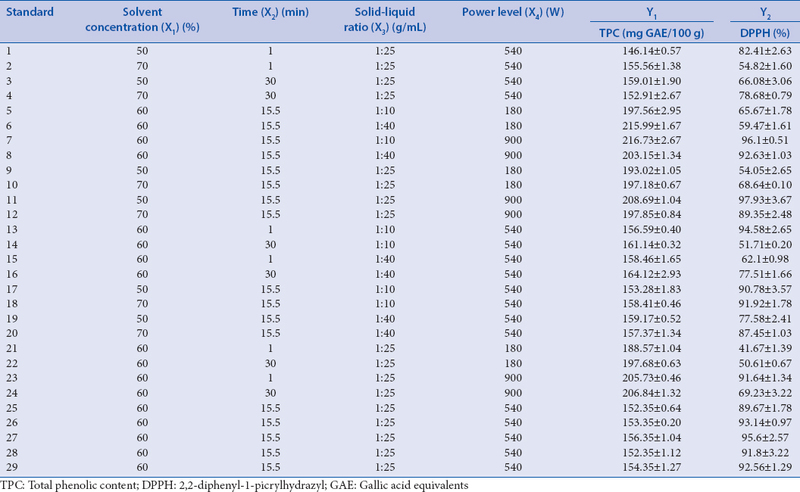 Results from [Table 2] depicts that, at 900 W power, 15.5 min extraction time, 60% solvent concentration, 1:10 g/mL solid-liquid ratio, the maximum yield of phenolics was obtained. However, the yield of bioactive molecules was found to be 135.26 ± 0.58 mg GAE/100 g in the control sample. Second-order polynomial equation for polyphenols yield was derived from multilinear regression analysis of the data as shown in [Table 3]. To determine the significant effect of process variables on polyphenols yield, ANOVA was performed. Model adequacy was tested by conducting lack of fit test and checking R2 value (coefficient of determination). From [Table 3], it can be observed that lack of fit is nonsignificant with an R2 value of 0.99, which signifies goodness of fit of the developed model. Where Y1 is the TPC, X1 is the solvent concentration, X2 is the extraction time,X3 is the solid-liquid ratio, and X4 is the microwave power. The extraction conditions of 15.5 min extraction time, 1:25 g/mL solid-liquid ratio, and 900 W microwave power with 50% solvent concentration showed 97.93% DPPH radical scavenging activity, while with 70% solvent concentration at same condition showed decreased DPPH radical scavenging activity of 89.35% [Table 2]. The yield of antioxidants was initially higher with lower solvent concentration followed by decreasing trend at higher level of solvent concentration [Figure 2]a, [Figure 2]c, and [Figure 2]d. Our results were based on reports claiming similar results where they reported the yield and amounts of antioxidants increased to 86.23% with solvent concentration of 65%. Higher value of DPPH radical scavenging activity of 94.58% was noticed initially at 60% solvent concentration with 1 min extraction time, 1:10 g/mL solid-liquid ratio, and 540 W microwave power [Table 2]. Later on, with increase in extraction time to 15.5 min, an increase in DPPH radical scavenging activity was seen up to 97.93%; however, at higher value of time factor to 30 min, sudden decrease in the antioxidants yield can be observed. Antioxidants yield by DPPH radical scavenging activity initially increased to 15.5 min followed by decreasing trend beyond it [Figure 2]a, [Figure 2]b, and [Figure 2]e. In a similar study on isolation of triterpenoid saponins from Ganoderma atrum, few researchers reported that triterpenoid yield increased till 20 min, after which there was gradual decrease. The quantity of antioxidants extracted initially was 68.64% against 180 W microwave power, 70% solvent concentration, 15.5 min extraction time, and 1:25 g/mL solid-liquid ratio [Table 2]. Further, with increased microwave power up to 540 W, recovery of antioxidants increased; however, significant reduction of antioxidants was seen with increased power level. Microwave power have significant positive effect on the radical scavenging activity of DPPH [Figure 2]d, [Figure 2]e, and [Figure 2]f. With the increase in microwave power, antioxidant extraction shows a rising trend. These findings were agreeing with the findings of previous report, where extraction efficiency from Buddleja officinalis Maxim was increased using microwave power of 900 W.
The observations from [Table 2] displays the maximal extraction of antioxidants with DPPH solution at 50% solvent concentration, 15.5 min extraction time, 1:25 g/mL solid-liquid ratio, and 900 W power level, whereas the control sample showed 82 ± 1.62% DPPH radical scavenging activity. The results of antioxidant recovery with the help of DPPH radical scavenging activity are represented in second-order polynomial equation in terms of coded factors. Where Y2 is the DPPH radical scavenging activity, X1 is the solvent concentration, X2 is the extraction time,X3 is the solid-liquid ratio, and X4 is the microwave power. ANOVA result as shown in [Table 3] demonstrates the model to be significant with acceptable F and P value. The R2 value was 0.96 which confirms good fitting of the model. The lack of fit was nonsignificant, whereas the P value of the developed model was significant. From the results, it was observed that solid-liquid ratio (X3) and microwave power (X4) had significant effect, whereas solvent concentration (X1) and time (X2) did not show any significant effect. From these results, it can be concluded that the developed model can predict antioxidant activity with higher accuracy. The developed model in RSM was used for the PSO. This was computed by applying SPSO algorithm. The parameters used in this study were as follows: initial population size was 40 particles, values of acceleration constants c1 and c2 were 0.5, weight value was 0.6 (which was kept constant with the generations), and the maximum number of generations was set to 500 for SPSO. The entire process finished after reaching the prespecified maximum number of generations (500). The developed model in RSM was used for the optimization using PSO. By optimizing developed model for both the responses TPC and DPPH, the best condition of the extraction process was determined. The optimum conditions for maximum TPC and DPPH values, i.e., 206.14 ± 2.70 mg GAE/100 g and 96.04 ± 1.67%, were obtained using methanol at 51.38% concentration, extraction time of 16.95 min, solid-liquid ratio of 1:23 g/mL, and microwave power level of 900 W, respectively. The developed model was further verified based on mean variation and percent of variation between the predicted and actual values of TPC and free radical scavenging activity by DPPH radicals, as shown in [Table 4]. A number of phytobiomolecules were detected and quantified in the optimally extracted samples separated on a RP-HPLC system coupled with a UV-vis detector. All the peaks obtained were compared with the respective standard's RT. Three phenolic compounds were identified: quercetin (RT in min = 22.86, chlorogenic acid (RT = 17.09), and gallic acid (RT = 6.19) [Supplementary [Table 1] and Supplementary [Figure 1]. The concentration of quercetin, chlorogenic acid, and gallic acid in the optimized extract was 11.25, 4.28, and 1.61 ppm, respectively. However, in the methanol extract, quercetin and gallic acid concentrations were 7.08 and 1.01 ppm. Different bioactive phytoconstituents were detected and identified using the GCMS system with their retention time in SMAE samples as shown in [Table 5] and Supplementary [Figure 2]. Majorly, ascorbic acid, phytol, and flavonol have been identified at 26.79, 29.03, and 39.70 min, which are essential components for showing various functional attributes. The presence of 0.0386% ascorbic acid in Sesame seed powder and quercetin of 0.40 mg quercetin equivalent g −1 (dry weight) in Sesame cake extracts has been reported., These results illustrate the importance of Sesame extracts, and its uses as a potent candidate for different functional properties. The micrographs of microwave-treated and -untreated plant samples are represented in [Figure 3]a and [Figure 3]b. There was not complete destruction on the cell walls, and the tissues were intact without any significant changes for untreated plant samples [Figure 3]a. However, there was disintegration of the tissues, surface of the sample was damaged, and texture was deformed as depicted in [Figure 3]b. It may be due to high electromagnetic waves which tend to break the cells of the plant samples, resulting in rupture of the cells. Similar results were also reported, where cell damage and complete rupture of cells were seen for myrtle leaves. Therefore, it was seen that microwave-treated Sesame plant leaves allow more phytochemicals to be extracted than the normal traditional method. Sesame leaves are rich source of phytochemical with potent antioxidant properties. For optimum extraction of these phytochemicals, MAE proved to be a convenient method for extraction. Mathematical models were used to optimize the process parameters to predict the optimum conditions. The total phenol extracted from Sesame plants with MAE was higher than the normal traditional methods. This present work established an important and optimized method for extraction of polyphenols from Sesame plant leaves using MAE. We also gratefully acknowledge the Vice-Chancellor, Tezpur University (Central University, Tezpur, Assam, India) for providing facilities to carry out the study. Dr. Khirod Kumar Dash, Assistant Professor, Food Engineering and Technology Department, is also duly acknowledged. We would like to acknowledge the financial support given by the Department of Science and Technology (DST), Government of India (DST-SERB; Grant No: SB/YS/LS-30/2014). Quideau S, Deffieux D, Douat-Casassus C, Pouységu L. Plant polyphenols: Chemical properties, biological activities, and synthesis. Angew Chem Int Ed Engl 2011;50:586-621. Tomás-Barberán FA, Andrés-Lacueva C. Polyphenols and health: Current state and progress. J Agric Food Chem 2012;60:8773-5. Balasundram N, Sundram K, Samman S. Phenolic compounds in plants and agri-industrial by-products: Antioxidant activity, occurrence, and potential uses. Food Chem 2006;99:191-203. Quiñones M, Miguel M, Aleixandre A. Beneficial effects of polyphenols on cardiovascular disease. Pharmacol Res 2013;68:125-31. Ramos S. Cancer chemoprevention and chemotherapy: Dietary polyphenols and signalling pathways. Mol Nutr Food Res 2008;52:507-26. Garcia BO, Castillo J, Lorente J, Ortuno A, Delrio JA. Antioxidant activity of phenolics extracted from Olea europaea L. leaves. Food Chem 2000;68:457-62. Braca A, Sortino C, Politi M, Morelli I, Mendez J. Antioxidant activity of flavonoids from Licania licaniaeflora. J Ethnopharmacol 2002;79:379-81. Yu J, Wang L, Walzem RL, Miller EG, Pike LM, Patil BS. Antioxidant activity of citrus limonoids, flavonoids, and coumarins. J Agric Food Chem 2005;53:2009-14. Higdon JV, Frei B. Tea catechins and polyphenols: Health effects, metabolism, and antioxidant functions. Crit Rev Food Sci Nutr 2003;43:89-143. Abou-Gharbia HA, Shahidi F, Adel A, Shehata Y, Youssef MM. Effects of processing on oxidative stability of sesame oil extracted from intact and dehulled seeds. J Am Oil Chem Soc 1997;74:215-21. Ashri A. Sesame breeding. Plant Breed Rev 1998;16:179-228. Xu J, Chen S, Hu Q. Antioxidant activity of brown pigment and extracts from black sesame seed (Sesamum indicum L.). Food Chem 2005;91:79-83. Liu B, Guo X, Zhu K, Liu Y. Nutritional evaluation and antioxidant activity of sesame sprouts. Food Chem 2011;129:799-803. Chen PR, Chien KL, Su TC, Chang CJ, Liu TL, Cheng H, et al . Dietary sesame reduces serum cholesterol and enhances antioxidant capacity in hypercholesterolemia. Nutr Res Rev 2005;25:559-67. Salerno JW, Smith DE. The use of sesame oil and other vegetable oils in the inhibition of human colon cancer growth in vitro . Anticancer Res 1991;11:209-15. Kita S, Matsumura Y, Morimoto S, Akimoto K, Furuya M, Oka N, et al. Antihypertensive effect of sesamin. II. Protection against two-kidney, one-clip renal hypertension and cardiovascular hypertrophy. Biol Pharm Bull 1995;18:1283-5. Hao JY, Han W, Xue BY, Deng X. Microwave-assisted extraction of artemisinin from Artemisia annua L. Sep Purif Technol 2002;28:191-6. Li H, Deng Z, Wu T, Liu R, Loewen S, Tsao R, et al . Microwave-assisted extraction of phenolics with maximal antioxidant activities in tomatoes. Food Chem 2012;130:928-36. 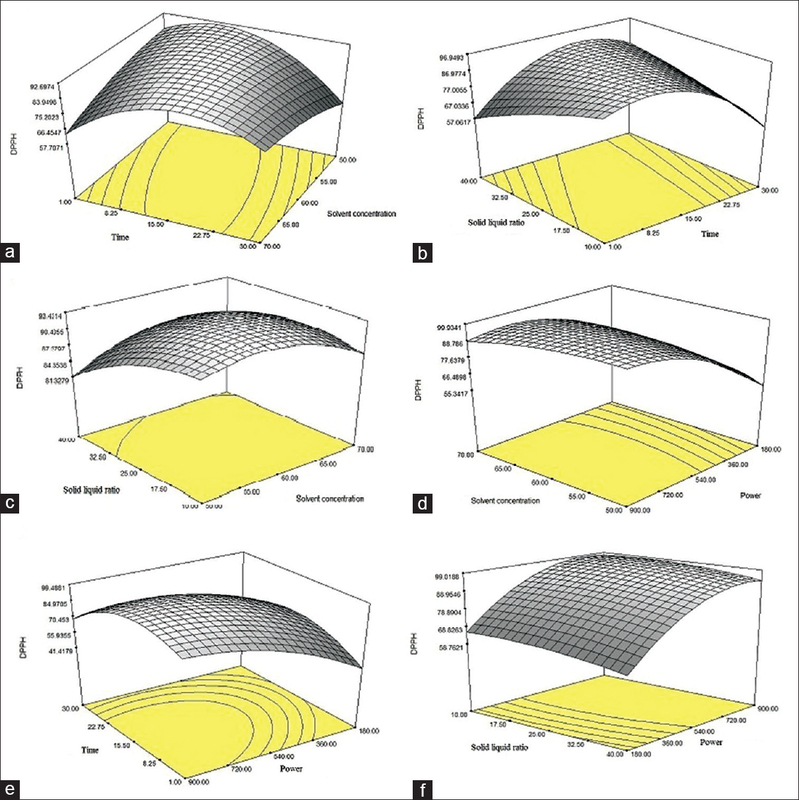 Jeganathan PM, Venkatachalam S, Karichappan T, Ramasamy S. Model development and process optimization for solvent extraction of polyphenols from red grapes using Box-Behnken design. Prep Biochem Biotechnol 2014;44:56-67. Duba KS, Casazza AA, Mohamed HB, Perego P, Fiori L. Extraction of polyphenols from grape skins and defatted grape seeds using subcritical water: Experiments and modeling. Food Bioprod Process 2015;94:29-38. Sarkis JR, Boussetta N, Blouet C, Tessaro IC, Marczak LD, Vorobiev E, et al . Effect of pulsed electric fields and high voltage electrical discharges on polyphenol and protein extraction from sesame cake. Innov Food Sci Emerg Technol 2015;29:170-7. Teh SS, Niven BE, Bekhit AE, Carne A, Birch J. Optimization of polyphenol extraction and antioxidant activities of extracts from defatted flax seed cake (Linum usitatissimum L.) using microwave-assisted and pulsed electric field (PEF) technologies with response surface methodology. Food Sci Biotechnol 2015;24:1649-59. Spigno G, De Faveri DM. Microwave-assisted extraction of tea phenols: A phenomenological study. J Food Eng 2009;93:210-7. Prakash Maran J, Sivakumar V, Thirugnanasambandham K, Sridhar R. Optimization of microwave assisted extraction of pectin from orange peel. Carbohydr Polym 2013;97:703-9. Chen SS, Spiro M. Study of microwave extraction of essential oil constituents from plant materials. J Microw Power Electromagn Energy 1994;29:231-41. Liang H, Wang W, Xu J, Zhang Q, Shen Z, Zeng Z, et al . Optimization of ionic liquid-based microwave-assisted extraction technique for curcuminoids from Curcuma longa L. Food Bioprod Process 2017;104:57-65. Hu X, Shi Y, Eberhart R. Recent advances in particle swarm, Proceedings of the 2004 Congress on Evolutionary Computation CEC 2004; Portland, Oregon, USA. IEEE 2004;1:90-7. Slinkard K, Singleton VL. Total phenol analysis: automation and comparison with manual methods. Am J Enol Vitic 1977;28:49-55. Kennedy J, Eberhart R. Particle swarm optimization. Proceedings of the IEEE International Conference on Neural Networks iv ICNN 95; Perth, WA, Australia. IEEE 1995;4:1942-48. Shi Y, Eberhart RC. Empirical study of particle swarm optimization. Proceedings of the 1999 Congress on Evolutionary Computation CEC 99; Washington, DC, USA. IEEE 1999;3:1945-50. Clerc M, Kennedy J. The particle swarm: Explosion, stability and convergence in a multi-dimensional complex space. IEEE Trans Evol Comput 2002;6:58-73. Saikia S, Mahnot NK, Mahanta CL. Phytochemical content and antioxidant activities of thirteen fruits of Assam, India. Food Biosci 2016;13:15-20. Xiao Z, Yu D, Niu Y, Chen F, Song S, Zhu J, et al. Characterization of aroma compounds of Chinese famous liquors by gas chromatography-mass spectrometry and flash GC electronic-nose. J Chromatogr B Analyt Technol Biomed Life Sci 2014;945-946:92-100. Garofulic IE, Dragovic-Uzelac V, Jambrak AR, Jukic M. The effect of microwave assisted extraction on the isolation of anthocyanins and phenolic acids from sour cherry marasca (Prunus cerasus var. marasca). J Food Eng 2013;117:437-42. Dahmoune F, Nayak B, Moussi K, Remini H, Madani K. Optimization of microwave-assisted extraction of polyphenols from Myrtus communis L. leaves. Food Chem 2015;166:585-95. Yusoff NI, Leo CP. Microwave assisted extraction of defatted roselle (Hibiscus sabdariffa L.) seed at subcritical conditions with statistical analysis. J Food Qual 2017;1-10. Sinha K, Chowdhury S, Saha PD, Datta S. Modeling of microwave-assisted extraction of natural dye from seeds of Bixa orellana (Annatto) using response surface methodology (RSM) and artificial neural network (ANN). Ind Crops Prod 2013;41:165-71. Chan CH, Yusoff R, Ngoh GC, Kung FW. Microwave-assisted extractions of active ingredients from plants. J Chromatogr A 2011;1218:6213-25. Eskilsson CS, Björklund E. Analytical-scale microwave-assisted extraction. J Chromatogr A 2000;902:227-50. Wang JX, Xiao XH, Li GK. Study of vacuum microwave-assisted extraction of polyphenolic compounds and pigment from Chinese herbs. J Chromatogr A 2008;1198-1199:45-53. Hu Z, Wen Z. Enhancing enzymatic digestibility of switchgrass by microwave-assisted alkali pretreatment. Biochem Eng J 2008;38:369-78. Singh A, Sabally K, Kubow S, Donnelly DJ, Gariepy Y, Orsat V, et al. Microwave-assisted extraction of phenolic antioxidants from potato peels. Molecules 2011;16:2218-32. Chen Y, Xie MY, Gong XF. Microwave-assisted extraction used for the isolation of total triterpenoid saponins from Ganoderma atrum . J Food Eng 2007;81:162-70. Wang S, Chen F, Wu J, Wang Z, Liao X, Hu X. Optimization of pectin extraction assisted by microwave from apple pomace using response surface methodology. J Food Eng 2007;78:693-700. Xiao W, Han L, Shi B. Microwave-assisted extraction of flavonoids from radix astragali. Sep Purif Technol 2008;62:614-8. Pan Y, He C, Wang H, Ji X, Wang K, Liu P, et al . 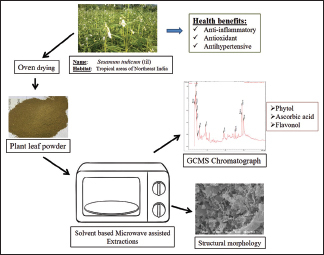 Antioxidant activity of microwave-assisted extract of Buddleia officinalis and its major active component. Food Chem 2010;121:497-502. Visavadiya NP, Narasimhacharya AV. Sesame as a hypocholesteraemic and antioxidant dietary component. Food Chem Toxicol 2008;46:1889-95. Mohdaly AA, Smetanska I, Ramadan MF, Sarhan MA, Mahmoud A. Antioxidant potential of sesame (Sesamum indicum) cake extract in stabilization of sunflower and soybean oils. Ind Crops Prod 2011;34:952-9. Zhang B, Yang R, Liu CZ. Microwave-assisted extraction of chlorogenic acid from flower buds of Lonicera japonica thunb. Sep Purif Technol 2008;62:480-3.